The Keyhole Nebula hopefully needs no explanation for its common moniker! 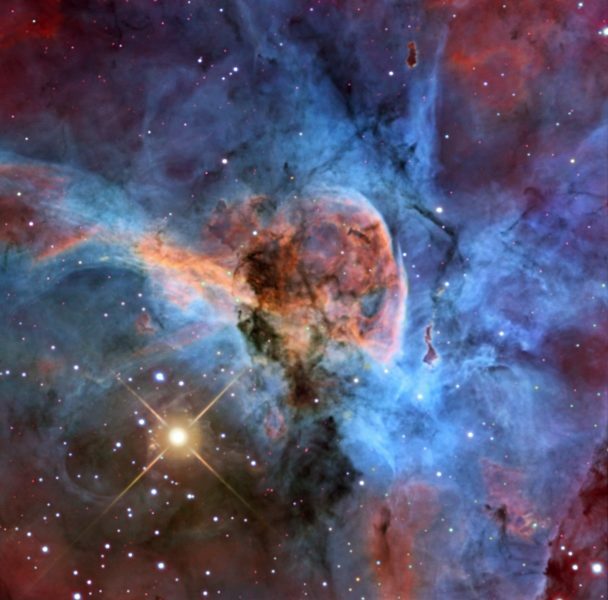 Sitting within the much larger Carina Nebula complex, the Keyhole also sits just adjacent to the unstable/dying star, Eta Carina, seen below and to the left in this image. The Keyhole is about 7 light years in diameter, and apparently has changed in appearance relative to when first observed, perhaps an effect of ionizing radiation from Eta Carina. For a view of the larger parent nebula, click HERE. All data was acquired by SSRO at CTIO in Chile in February 2019, using a 16″ RCOS and FLI 16803 on a Planewave 200HR mount. This is a tricolor narrowband image in the so-called Hubble palette, wherein the emissions of sulfur (SII), hydrogen (Ha), and oxygen (OIII) are mapped to the red, green, and blue channels, respectively. All subs were of 30 min duration for a total exposure of about 38 hours. Pre-processing was in Maxim and PixInsight, and all stretching, color balancing, and other manipulations were in Photoshop.